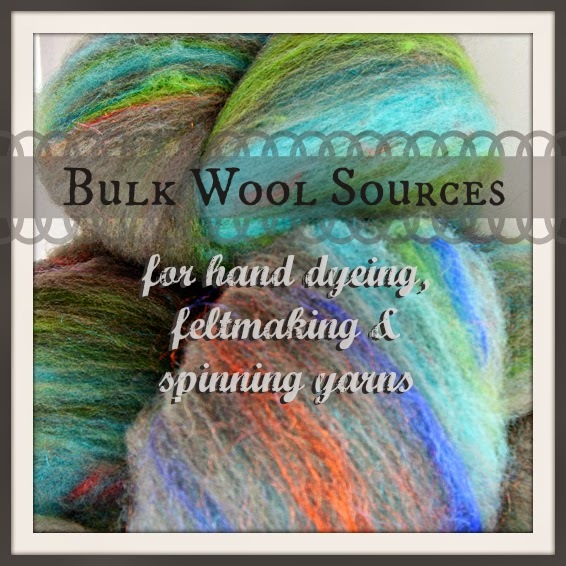 Want to know where to get great deals on bulk quantities of wool and silk for your fiber arts? Check out these sources and suppliers for your handmade fiber crafts! I've been doing fiber crafts since about 2005 when I caught the feltmaking bug after taking a college fiber arts course. That obsession quickly turned into a small business which I playfully named "The Funky Felter" and opened an Etsy shop as well as started selling at craft shows across the Midwestern United States. It was all very new to me at the time and I threw a lot of funds at buying fibers and supplies willy nilly here and there. Do I regret it? Not one bit! I have enjoyed every minute playing in the wool over the years wherever I might have purchased it. However, from a business perspective, I realize now (many years later and many personal and professional trials wiser) that keeping costs low and researching supply sources are quite important - at least for turning a profit and not just a big ol' smile while practicing your crafts and hobbies. I personally no longer sell fiber products or supplies (at least at the time this is written), but I did for several years and made a really good go at selling finished handmade felted creations along with kits and some hand dyed wool batts, silks and felted wool beads. For me, it was usually more about buying interesting supplies to make more whimsical handmade felted and hand dyed products. I'm sure some of you can relate to that if you are passionate about traditional fiber crafts like hand dyeing, spinning yarns and wet or needle felting. One of my most popular blog posts is from way back in 2009. This post is a concise listed rundown of suppliers and sources for buying bulk quantities of wool and silk fibers. There are also a lot of useful suggestions in the comments on that original blog post. Below you'll find the link to that article. I hope you find it helpful in your own research for finding good deals online and elsewhere for your own fiber crafts. And, in addition to the online sources listed in the bulk fiber article below, I urge you to check out locally sourced fibers like alpaca and sheep farms in your area. My family has had such a good time over the years attending open houses and sheep shearing days at local fiber farms - not just a great way to spend your funds on supplies in your own communities but also a great quality time to spend with those you love. CLICK HERE for my original article on where to purchase bulk wool and silk fibers at great prices online. Don't forget to read the comments for additional sources from my blog readers.